A great white shark that swiftly attacks its prey. The Shark is a creature found in Atlantica, only appearing there in Kingdom Hearts. He first appeared in Disney's The Little Mermaid. The Shark is normally found swimming around the Sunken Ship area. He is considered a minor enemy at first, as the player can escape fighting him, but he must be defeated later to enter Ursula's lair. He attacks randomly, and can do a great deal of damage. 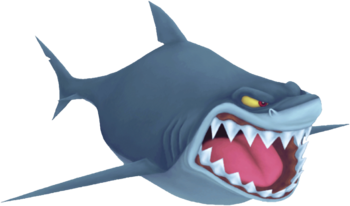 The Shark is one of only eight enemies in Kingdom Hearts who do not have entries in Jiminy's Journal (the others being AntiSora, Bit Sniper, the Cave of Wonders Guardian, Chernabog, the Crank Tower, Shadow Sora, and World of Chaos). The Shark mainly appears around the Sunken Ship and attacks Sora and company while they are in the area. When the friends are searching for Ursula's lair, he attacks in an attempt to eat them. Upon being defeated, he flees. However, he still remains around the Sunken Ship after the sea-witch's defeat. The Shark is modeled after a great white shark, with a rotund body and yellow eyes. The top half of his body is a dark blue-grey, while the underside is a lighter blue-grey color. He has three gill slits on either side of his body and a small nick in his tail fin. The Shark only has one dorsal fin, without the second, smaller dorsal fin further down his body like most sharks. While his teeth are the typical triangular shape of a great white, they seem to lack serrations and, most notably, there is only one row of teeth in his mouth, as opposed to the multiple, rotating rows of teeth common to all sharks. The Shark, named Glut in official Disney records, originated from the Disney 1989 movie, The Little Mermaid. He appears in the beginning of the film, attempting to eat Ariel and Flounder. He pursues them across the Sunken Ship, destroying it in the process. He is defeated when he gets his head stuck in an anchor and is not seen for the remainder of the film. In a draft of the movie, The Shark was supposed to battle Ariel and Flounder when they try to stop Eric and "Vanessa"'s wedding. However, he is tricked into helping Ariel reach the ship by Flounder, and bites the barrel (later revealed to be a gunpowder peg) Ariel was riding. It is implied he would have died from the explosion that followed.